The Nigeria Police Force has offered to support the Independent Corrupt Practices and Other Related Offences Commission (ICPC) tackle corruption in Nigeria through staff capacity development. The offer was made by the Inspector General of Police (IGP), Solomon Arase who was at ICPC headquarters recently to forge a common front against corruption with the Commission. Arase stated that the two agencies need to build a strong working relationship together to combat the problem of corruption facing the country. He urged the Commission to make use of its training facilities in Enugu to develop the capacity of its staff, noting that the training academy boasts the best specialists in crime analysis. He said, “The Nigeria Police contributed immensely towards the birth of ICPC. We want to ensure further cooperation to ensure that we drive our anti-corruption crusade to a logical conclusion. One area we can really cement our relationship is joint training. 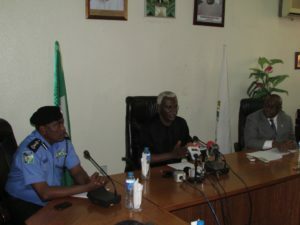 ICPC Chairman, Ekpo Nta while responding commended the Nigeria Police for its strategic support to the Commission, noting that the Police had contributed greatly to the achievements of ICPC. He lauded Arase for employing technology to tackle crime in the country, adding that his innovative approaches to policing had transformed the force within his brief stay as IGP.